In this literary masterwork, Louise Erdrich, the bestselling author of the National Book Award-winning "The Round House" and the Pulitzer Prize nominee "The Plague of Doves" wields her breathtaking narrative magic in an emotionally haunting contemporary tale of a tragic accident, a demand for justice, and a profound act of atonement with ancient roots in Native American culture. North Dakota, late summer, 1999. Landreaux Iron stalks a deer along the edge of the property bordering his own. He shoots with easy confidence -- but when the buck springs away, Landreaux realizes he's hit something else, a blur he saw as he squeezed the trigger. When he staggers closer, he realizes he has killed his neighbor's five-year-old son, Dusty Ravich. The youngest child of his friend and neighbor, Peter Ravich, Dusty was best friends with Landreaux's five-year-old son, LaRose. The two families have always been close, sharing food, clothing, and rides into town; their children played together despite going to different schools; and Landreaux's wife, Emmaline, is half sister to Dusty's mother, Nola. Horrified at what he's done, the recovered alcoholic turns to an Ojibwe tribe tradition -- the sweat lodge -- for guidance, and finds a way forward. Following an ancient means of retribution, he and Emmaline will give LaRose to the grieving Peter and Nola. “Our son will be your son now,” they tell them. LaRose is quickly absorbed into his new family. Plagued by thoughts of suicide, Nola dotes on him, keeping her darkness at bay. His fierce, rebellious new “sister,” Maggie, welcomes him as a coconspirator who can ease her volatile mother's terrifying moods. Gradually he's allowed shared visits with his birth family, whose sorrow mirrors the Raviches' own. As the years pass, LaRose becomes the linchpin linking the Irons and the Raviches, and eventually their mutual pain begins to heal. But when a vengeful man with a long-standing grudge against Landreaux begins raising trouble, hurling accusations of a cover-up the day Dusty died, he threatens the tenuous peace that has kept these two fragile families whole. 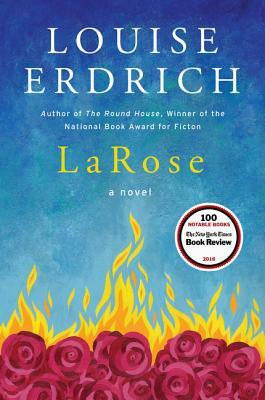 Inspiring and affecting, "LaRose" is a powerful exploration of loss, justice, and the reparation of the human heart, and an unforgettable, dazzling tour de force from one of America's most distinguished literary masters.